MILAN — To celebrate the launch of Jura’s new fully automatic household coffee machine, ENA 8, Jura has released four cocktail recipes inspired by all four styles, or “destinations”. The new line has been created with the intention of taking you on a journey, and there is a design to suit all personalities. More than just coffee, the new ENA 8 is the perfect coffee extension for all your mixology needs. There are four styles or “destinations” available in Jura’s ENA 8 range, including Massive Aluminium, Nordic White, Metropolitan Black and Sunset Red. Metropolitan Black RRP $1,899 – Inspired by the hustle and bustle of city life with vibrant cafes, boutiques and bright neon lights illuminating the dark night sky. Think artificial office lights, or sleek white kitchens in contrast with the metropolitan black ENA 8. Nordic White RRP $1,899 – Think purity and clarity in the snow swept mountains. Take a step away from the world of colour and explore the vast land beyond with the Nordic White ENA 8. Sunset Red RRP $1,899 – With clay roof tiles and the warm light of the evening sun beaming through the window, experience the red earth through the sunset red ENA 8. 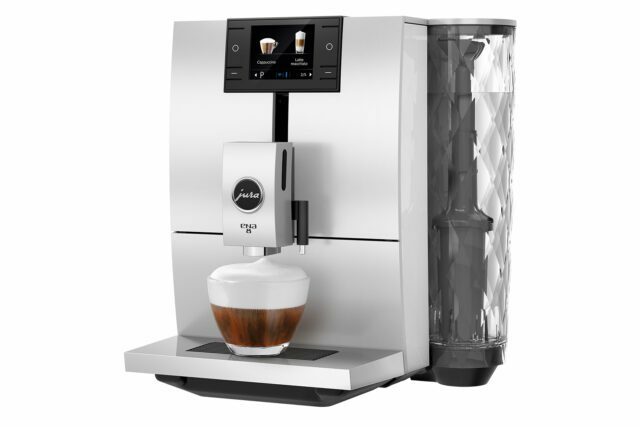 Massive Aluminium RRP $2,699 – Combines traditional craftmanship with state-of-the-art product technology to create the world’s first coffee machine totally encased in solid aluminium adding 1.9kgs to the overall weight of the machine. *Cocktail inspired by Massive Aluminium design elements. Stir over ice and strain into a chilled martini glass. Garnish with a lemon twist. Build the liquor over ice and top with coconut milk. Shake vigorously with ice and double strain into a chilled cocktail glass. *Cocktail inspired by Sunset Red design elements. Shake with ice and double staring into a chilled cocktail glass. Garnish with a sliver of burnt orange zest. Jura ENA 8 is available now online at www.au.jura.com, selected electrical retailers, department stores and independent and specialty outlets.